Several years ago, we began to notice that the television show Modern Family was doing a bit of product placement. A Toyota Prius was driven by Jesse Tyler Ferguson’s character Mitchell Pritchett. Apple products have made many appearances including an entire episode shot on i-everythings. Audi automobiles also got mentions. 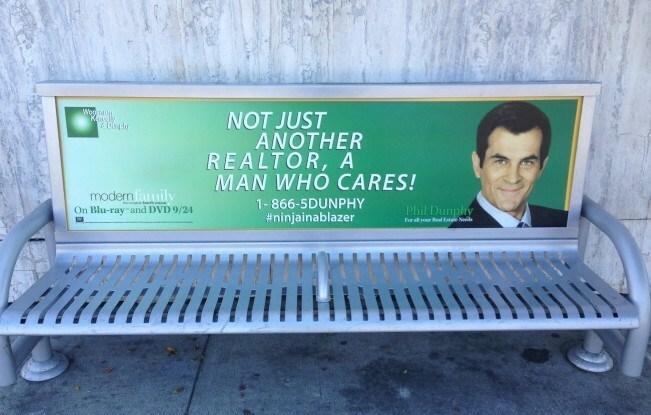 This product placement was taken to an entire new level when the National Association of Realtors (NAR) paid what we are betting was a huge fee to have actor Ty Burrell (Phil Dunphy) use an entire episode to explain in detail the difference between Realtors and “regular” real estate agents. The NAR is also producing a series of ads starring Burrell that appear on other shows. This made me think of another trend. During one commercial break while watching another show, I saw Burrell in the NAR commercial, followed immediately by an Allstate ad featuring Adam DeVine (who plays Andy, Haley Dunphy’s one true love) and THAT was immediately followed by an ad for Voya Financial starring Ferguson. It was a huge hint that Modern Family has taken over broadcast television. We have seen Sofia Vergara (Gloria Pritchett) plug Head and Shoulders and CoverGirl while Julie Bowen (Claire Dunphy) has done ads for Neutrogena, Bridgestone Tires and Olive Garden. Eric Stonestreet (Cameron Tucker) has appeared in ads for AT&T, ESPN and Stand Up for Center. Sarah Hyland (Haley Dunphy) has been in Domnio’s Pizza ads and Jeep and Calgon. Sharyn and I began to have a discussion on how the popularity of one product, in this case a television show called Modern Family, could impact the success of the products of another company. And that led us to talk about how our client’s could get THEIR products on a television show. 1. Make sure your product fits the character’s lifestyle. It should blend, and not be noticed. If you watched a movie of MY life, you would see a variety of brands (Dell, Toshiba, Sharp, GE, Canon, SONY, Apple, Toyota) all competing for attention, so I am willing to be bought! In the case of Modern Family, the i-phone episode fit the characters. 2. Be able to easily explain how your product can make the show better. Will your Apple products make our home studio rock with better sound and video quality? 3. It is not going to be free. You are going to spend thousands of dollars per second unless you are the pet rock product of the moment. 4. Invite costume designers to press previews and showroom visits. Send them your product for consideration. 5. Tweet pictures to set designers, producers and costume departments. 6. Make your pitch DIRECTLY TO THE POINT. Be as brief as possible. 7. Be ready to sign the most one-sided contracts in your life – including non-disclosures and pinky swears of secrecy. 8. Hopes high, expectations low. Producers turn down way north of 90% of requests. Only 2% of global advertising is from product placement. 9. Have a great story for why your product should be on the show. Have story ideas instead of press releases. Piggyback on timely news, current event marketing. 10. When you get on a show – used it to your every advantage. We have a client that does the picture framing for the stadium of a local sports team. Each time I see her do a 30-second presentation, I have to remind her that she needs to tell EVERYONE. When it is time to get your brand noticed, discovered, and have its message improved, give us a call at 800-705-4265.